When you have a number of moving parts in an athletic activity, everything becomes important and that includes the follow-through. One might assume that once the disc is released from the grip that follow through doesn’t really matter. But when you pay attention to your follow through, you will begin to see the impact that it has on your shot. Why is the Follow Through So Important? The follow through is so important because it represents the entire process of the swing. If you throw the disc with a backhanded style and your arm flops out after release, then the disc is going to drift to the right, likely wobbling along the way, and then drop half the distance of its potential. The follow through, then, is the intention of the thrower. If you intend for the shot to be smooth, then you will want to make sure that your follow through is also smooth. The moment you begin to rush or try to hold your follow through up short, it is reflected in the throw itself. In order to better understand this, look to American football or baseball. When a quarterback in football throws the ball, there is a fluid motion from start to finish. Each quarterback’s throw will be different, but their follow through will always be the same from one toss to the next. If anything interferes with the follow through, whether a defender hits his arm at the release or grabs his arm from behind while he’s trying to throw, then the ball will not reach its intended target. The ball could sail high or drop short. In baseball, if the second baseman is trying to turn a double play and jumps out of the way of an oncoming runner while throwing the ball, his instincts to protect himself often overpower his instinct to follow through. He is already planning on bracing himself for the fall before the ball is released and as a result, the throw will either be off the mark or will lack the power and speed necessary to get the man out at first base. There’s only one sure way to master the follow through in any sport and that is to pay attention to exactly what your body is doing once the disc is released. Most of the time we are paying attention to where the disc is going that we don’t think about the follow through. By paying attention to how your arm moves just after the release, and how your shoulders hold up and whether your legs remain in position or move, you will begin to see how adjusting these aspects affect the throw itself. What is a proper follow through? 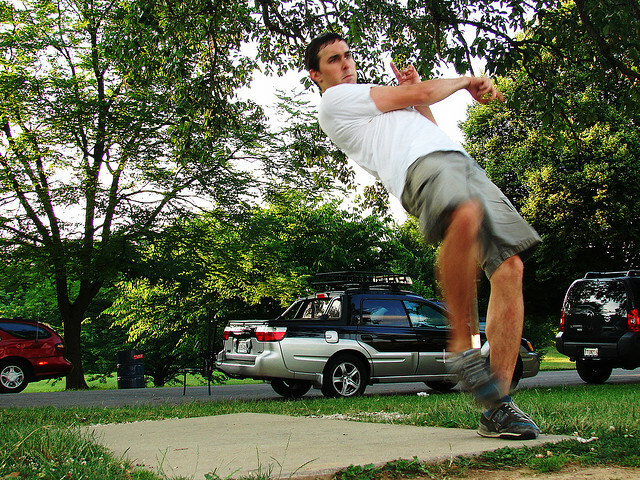 Ideally the follow through will simply be the natural extension of the motion created for the throw. By holding your finish, as they say in regular golf, you will be able to tell a lot about how your follow through is working. If you’re having trouble with any aspects of your throw, then concentrate on your follow through and don’t force your arms to a stop or change their natural motion from the throw. Creative Commons Flickr Photo courtesy of sidewalk flying.